Stinging Nettle has been used for centuries as a medicine and also as a food. It's mineral and vitamin-rich, and a naturally nutritious way to help maintain a healthy urinary tract and flush toxins from your system. This herb is used to expel gravel from the bladder and to combat urinary infections. It is said to uplift a weary body and reduce fatigue as well as, improves thyroid function. Nettle has been used for ages for allergies and respiratory problems. It is shown to be effective in stopping external (with topical use) and internal bleeding. It is helpful in reducing menstrual flow, uterine and internal hemorrhage, blood in the urine, diarrhea, and dysentery. 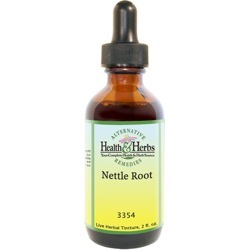 Nettle root herbal extract can be used as a hair tonic and growth stimulant, as well as an anti-dandruff shampoo. For men's health, the herb has been helpful in reducing inflammation in the prostate gland. Nettle has been helpful in easing neuralgia, sprains, tendonitis, sciatica, arthritis, rheumatism and gout. Nettles may also help to reduce certain skin inflammations such as eczema and insect bites. Stinging nettle root extracts have been shown to be effective in stopping external (with topical use) and internal bleeding. Used for centuries, Nettle extract is nutritive that is used as a tonic to nourishes and detoxify the entire system. It has a high iron content and it is considered beneficial for anemia by building red blood cells, and the high vitamin C content ensures that the iron will be absorbed by the body. The plant is comprised mainly of complex sugars and lectins. It also contains prostaglandins which have properties that support resistance to redness and irritation. The leaf contains high levels of protein, calcium, phosphorus, magnesium, iron, and beta-carotene, as well as high amounts of vitamins A, C, D, and B complex. the natural cleanse may help to remove metabolic wastes, is both gentle and stimulating on the lymph system and helps to promote easy disposal through the kidneys. Preparations made from Nettle leaf are traditional remedies for benign prostatic hypertrophy, or BPH, in men. This non-cancerous condition causes enlargement of the prostate gland that can interfere with urination. Today, it is widely used in Europe to treat the problem. Nettle is particularly effective in helping to prevent kidney stones, by keeping the crystals from forming into stones, as well washing the bacteria away. Remedies made from the plant have been used to prevent nighttime urination in children. Stinging nettle has been used to treat all kinds of painful and inflammatory conditions. The herb is also thought to purify the blood and neutralize and prevent the crystallization of uric acid, further helping to alleviate inflamed arthritic joints, gout and rheumatism. Studies are small, but they do suggest that some find relief from joint pain when applied topically to painful areas of the body. Another study showed that taking the herb in an oral extract, along with nonsteroidal anti-inflammatory drugs (NSAIDs), allows people to reduce their dose. Nettle's high iron content makes it an excellent remedy for combating anemia and fatigue. It is believed to support the liver and the female hormonal system. Some women use the herb during pregnancy to protect against bleeding and to strengthen the fetus. Stinging nettles also help to reduce PMS symptoms and processes estrogen to relieve menopausal symptoms. It also curbs excess menstrual flow and is often used in herbal tonics to remove fibroids and regulate periods. As an astringent, it also shrinks inflamed tissues and helps to alleviate hemorrhoids. With regard to women's health issues, Nettle leaf is believed to be effective against vaginal infections, such as Candida, a yeast infection. And the herbal tincture, or tea, is believed to promote milk production in nursing mothers. Nettle root is used to cleanse the digestive tract, promote healthy digestion and ease stomach problems. Nettle roots are effective at reducing symptoms of digestive distress ranging from acid reflux, excess gas, nausea, colitis, Celiac disease. It is believed to be excellent support for the endocrine system including the thyroid, spleen, and pancreas. Nettle, with its iodine content, is said to stimulate healthy thyroid function effectively and is considered, in herbal medicine, to be helpful in treating goiter. Nettle is well-known as a folk remedy for hay fever and other allergies. Nettle roots and leaves have been used as an herbal treatment and a homeopathic remedy for the relief of nettle allergies such as asthma, hay fever, hives and another allergic dermatitis. It helps to clear congestion in the nose and chest and is commonly used today for coughing, bronchitis, COPD and tuberculosis (TB). A compound found in the Nettle plant extract, kynurenic acid, is a substance that is getting attention recently due to the positive cognitive benefits it has had in animal studies. Nettle tested in certain neurobiological disorders, such as Alzheimer's disease, may respond to the herb. This compound may also help with ADD, ADHD and similar disorders. Nettle is high in boron, which has been said to help raise estrogen levels, therefore improving short-term memory and helping raise the mood of those who are suffering from Alzheimer's disease. It has also been used for centuries and found to be effective, both internally and externally, for multiple sclerosis symptoms. Nettle root relieves eczema and acne, removes warts when applied topically, and relieves the itching from nettle rash. It is believed to have a stimulating effect on the scalp when used as a hair rinse and helps to regenerate both hair growth and restore it to its original color. It works to relieve dandruff and conditions the scalp. Ingredients: Nettle Root, Structured Water, 20% Alcohol. Non-Alcohol: Nettle Root, Structured Water, Vegetable Glycerin. Contraindications: Do not take Nettle tincture if you have high blood pressure. Some people may experience mild gastrointestinal upset with the use of this herb. There are concerns that Nettle may interact with prescription medications used for diabetes, high blood pressure, sedation and inflammation; therefore, if taking these medications, please consult your physician before taking the herb. Stinging nettle extract may decrease how well the body excretes lithium, so those who are taking the medication should not consume the herb in any form. People with fluid retention due to congestive heart failure or kidney disease should not use Nettle liquid tincture, nor should those who think they are coming down with flu, because the herb reduces the body's production of immune chemical interleukin-6. Because of its diuretic properties, Nettle should not be used regularly unless high potassium foods such as bananas and fresh vegetables are consumed or potassium supplement is taken. Nettle can alter the menstrual cycle and may contribute to miscarriage, pregnant women should not used the herb.